Definition at line 61 of file llvfsthread.h. Definition at line 64 of file llvfsthread.h. Definition at line 194 of file llvfsthread.cpp. References LLVFSThread::FILE_RENAME, LLVFSThread::FILE_WRITE, LLVFS::getMaxSize(), LLVFS::incLock(), llassert, llendl, llwarns, mBuffer, mFileID, mFileType, mOperation, mVFS, S32, VFSLOCK_APPEND, and VFSLOCK_READ. Definition at line 253 of file llvfsthread.cpp. References LLQueuedThread::QueuedRequest::deleteRequest(), LLVFSThread::FILE_RENAME, LLVFSThread::FILE_WRITE, LLQueuedThread::FLAG_AUTO_DELETE, llendl, llerrs, mBuffer, mOperation, and LLQueuedThread::STATUS_QUEUED. Referenced by LLVFSThread::read(), LLVFSThread::readImmediate(), LLVFSThread::write(), and LLVFSThread::writeImmediate(). Definition at line 237 of file llvfsthread.cpp. 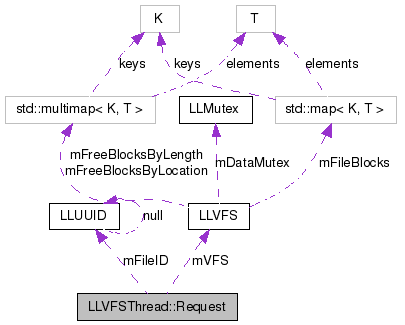 References LLVFS::decLock(), LLVFSThread::FILE_RENAME, LLVFSThread::FILE_WRITE, mFileID, mFileType, mOperation, mVFS, VFSLOCK_APPEND, and VFSLOCK_READ. Definition at line 80 of file llvfsthread.h. Definition at line 72 of file llvfsthread.h. Referenced by LLVFile::isReadComplete(), LLVFSThread::readImmediate(), and LLVFSThread::writeImmediate(). Definition at line 88 of file llvfsthread.h. Definition at line 76 of file llvfsthread.h. Definition at line 84 of file llvfsthread.h. Definition at line 274 of file llvfsthread.cpp. References LLVFSThread::FILE_READ, LLVFSThread::FILE_RENAME, LLVFSThread::FILE_WRITE, LLVFS::getData(), llassert, llendl, llerrs, llformat(), mBuffer, mBytes, mBytesRead, mFileID, mFileType, mOffset, mOperation, mVFS, LLVFS::renameFile(), and LLVFS::storeData(). Definition at line 106 of file llvfsthread.h. Referenced by deleteRequest(), getBuffer(), processRequest(), and Request(). Definition at line 108 of file llvfsthread.h. Definition at line 109 of file llvfsthread.h. Referenced by getBytesRead(), and processRequest(). Definition at line 103 of file llvfsthread.h. Referenced by finishRequest(), getFilename(), processRequest(), and Request(). Definition at line 104 of file llvfsthread.h. Referenced by finishRequest(), processRequest(), and Request(). Definition at line 107 of file llvfsthread.h. Definition at line 100 of file llvfsthread.h. Referenced by deleteRequest(), finishRequest(), getOperation(), processRequest(), and Request(). Definition at line 102 of file llvfsthread.h. Referenced by finishRequest(), getVFS(), processRequest(), and Request().